We went for a foraging outing cleverly disguised as a walk today. I kept nibbling on things and then handing them to others in our little group, saying things like, "I think this might be shepherd's purse. Eat it. It tastes like lettuce." Garlic mustard, however, is easy to spot, and it's taking over. Knowing that no one would mind if I grabbed a lot of it, I pulled several plants out by their roots. Once we got home, I made this salad. The recipe is from Edible Wild Plants, by John Kallas, Ph.D. There are actually several books with the same name, I have two; this one and a field guide. 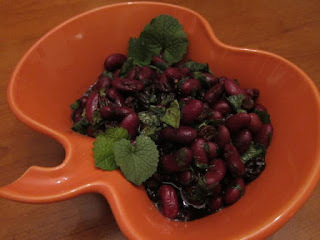 This salad is a quick thing: a can of red kidney beans, rinsed, some garlic mustard and raisins, tossed with balsamic vinegar, olive oil, salt and pepper. I liked it, and I have some greens left over to toss in a salad if I can do that in the next day or so.